Olivier award winning James Graham was lauded last year for having two plays (Ink and Labour of Love) running side-by-side in the West End. 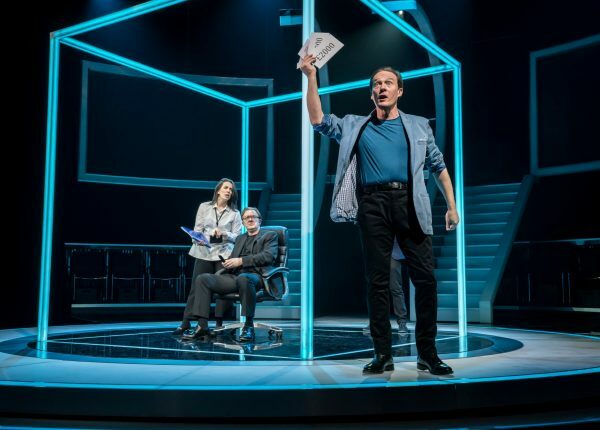 Now he’s back at the Noel Coward Theatre with a transfer piece from Chichester, creating a terrific buzz with this exuberantly entertaining and thought-provoking interactive piece: Quiz. 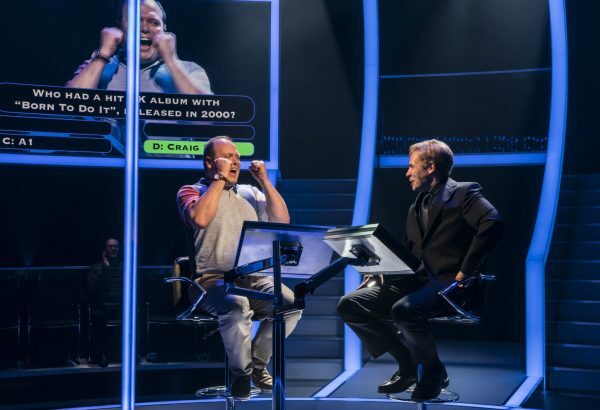 Here in Quiz Graham re-examines the case of the so-called “coughing major”, the 2001 contestant who was accused of cheating his way to the top prize on the ITV show Who Wants to be a Millionaire? His wife Diana and Welsh acquaintance, Tecwen Whittock (portrayed by Mark Meadows here), were said to have prompted him to the right answers with tactical coughs during the recording. 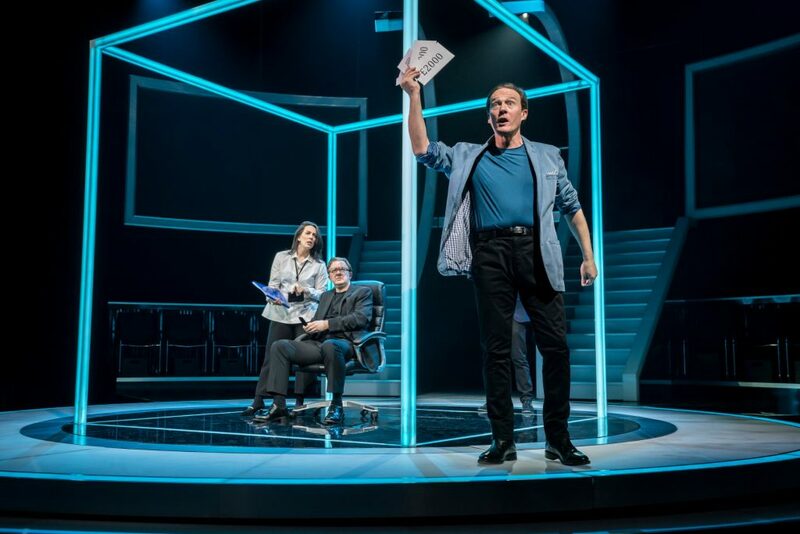 Robert Jones TV studio design at the Noel Coward with a revolving neon-lit cube at its centre and audience members on stage as the drama unfolds is a clever idea. Tied to the seats are Keypads allowing audience members to vote at the end of each act on whether we think that the Ingrams are guilty or innocent? Directed by Daniel Evans, an ensemble of 12 plays a total of 54 characters in the show with expert timing and quick costume changes! 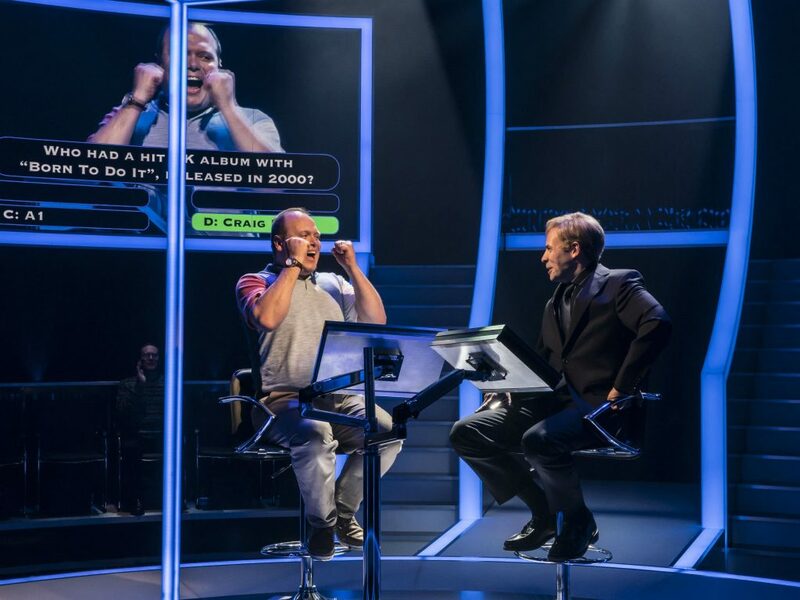 A myriad of large screens dotted around the theatre hype up the tension of a televised game show with pumping music as the TV scenes take place showcasing the events. 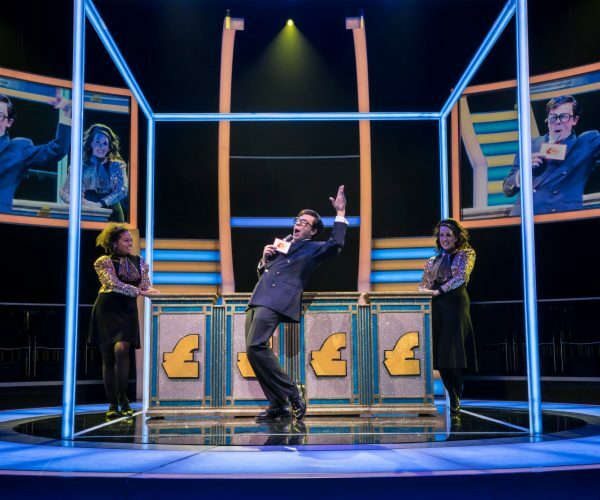 There’s a whirlwind history of TV quiz shows – with Keir Charles performing a range of question masters (Des O’Connor, Leslie Crowther, and an uncanny Chris Tarrant!). ITV we learn was shaped round shows such as Take Your Pick and The Price is Right and Cash Mountain (as Millionaire was going to be called) was a fresh idea on the quizzes we all love to think we’re good at! 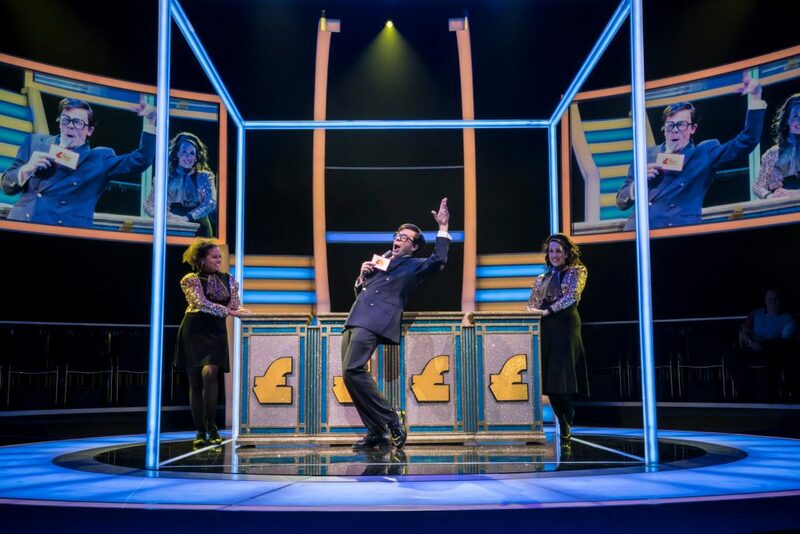 We also interact with a pub quiz, where we see how Ingram’s wife, Diana (Stephanie Street), and her brother Adrian Pollock (Henry Pettigrew) start by winning £30 here and £50 there in pub quizzes before Adrian, having something of a cash flow problem, hits on the idea of rigging the odds to get onto Millionaire. Sister and brother manage to go on the show and both win, but the final option to get more money is to put Charles centre stage. 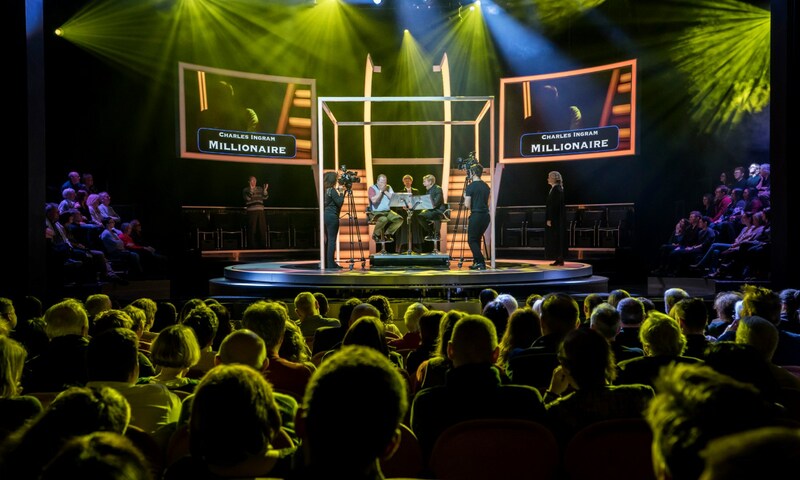 At the core of the piece is the riddle of why Charles (Gavin Spokes), having lost two of his “lives” in the earlier rounds of Millionaire, went on to hit the jackpot when the recording was resumed the following day. At the end of the first half, his guilt looks transparent. But after the interval, with Sarah Woodward scathingly passionate as his defence barrier, you may start to have doubts. The defence team draws forensic attention to an editing-job on the incriminating tape handed over by TV executives, forces us to do a double-take on events we have seen by showing them in a fuller context. Is the defence right in suggesting Ingram was dialling up the bumbling eccentricity because of a need he felt to play a role (and increase the tension) for the cameras? Have we Woodward asks, chosen “a more entertaining lie over a less extraordinary truth”? To what extent have been manipulated by the first half of the show itself? Graham has done it again with a play that manages to register the personal tragedy of the Ingrams, analyse the notion of fair play, touch on present politics, and overflow with information and ideas. And my final answer it is also huge fun! QUIZ is now running at the West End’s Noël Coward Theatre for a strictly limited season until 16 June. For more information and tickets see online.